Pain in the foot is problematic and can often limit your ability to participate in normal activities. This pain is even more problematic when the pain doesn't seem to resolve or keeps coming back. One such problem, that is often missed by many physicians, is a condition called Lisfranc Dislocation. With this particular injury, a fracture may be present or may be absent, causing the diagnosis to often be difficult even on X-ray. What Is A Lisfranc Fracture/Dislocation Injury? 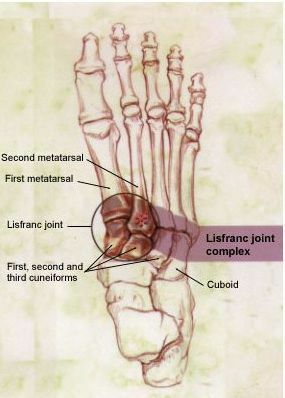 The Lisfranc fracture or dislocation is a midfoot injury that involves the joint between the 2nd metatarsal and the medial cuneiform. The Lisfranc ligament in this area can be injured or torn and leads to a condition of chronic pain due to continued dislocation of the midfoot in this area even with the simple act of walking. Due to this injury, the pain may be present for a period of time and then resolve, recurring later. Since the injury is to a ligament, this injury is notorious for failing to heal and chronic pain (or recurrent pain) is common. If the area is not treated, or treated incorrectly, it may lead to not just chronic foot pain, but recurrent foot sprains or even arthritis to the involved joints over time. The most common mechanism of injury is "forced flattening of the arch" as we have seen from gymnastics, wrecking after a motorcycle jump or just stepping off a curb funny. A really good midfoot sprain has this type of injury as a possibility. 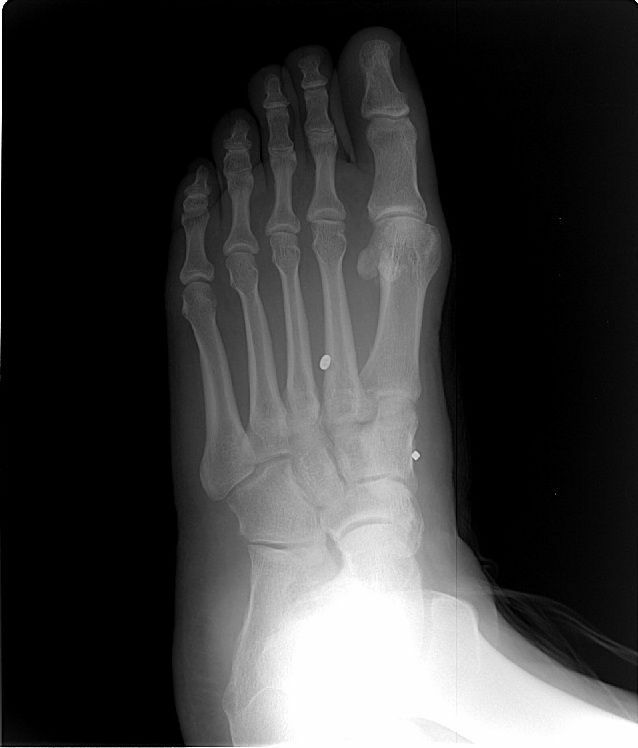 Pain is usually localized to the Lisfranc joint complex area and can be accompanied with swelling to the midfoot area. Eversion of the foot at the Lisfranc joint can cause pain. X-rays are diagnostic of the problem, including seperation at the Lisfranc joint and poor aligment of the third metatarsal with the intermediate cuneiform. This x-ray must be weightbearing to allow proper visulalization. Since these are often more difficult to visualize, the Lisfranc injury is commonly missed. Conservative Treatments: Casting: If this is an acute injury, this may heal with casting or placement in a protective walking boot. Most studies now don't recommend conservative treatments as this often fails. A new treatment involving placing a wire across the joint that forces re-approximation, but allows the anatomic motion required for running, walking and participation in regular activities. We recommend this last treatment as it provides the quickest recovery and most anatomic alignment.